Rotator cuff disease is among the most prevalent musculoskeletal disorders treated by orthopedic surgeons. While supraspinatus tears are far more prevalent, subscapularis tears comprise between 3.5 and 8 % of all rotator cuff tears (Codman EA, Lesions of the supraspinatus tendon and other lesions in or about the subacromial bursa. In: The shoulder. Thomas Todd Co, Boston, pp 65–67, 1934; Deutsch et al., Am J Sports Med 25:13–22, 1997; Frankle and Cofield, Rotator cuff tears involving the subscapularis tendon. Techniques and results of repair. In: Proceedings of the fifth international conference on Shoulder Surgery, International Shoulder and Elbow Society, Paris, p 52, 1992) and frequently go undiagnosed (Bennett, Arthroscopy 17:173–80, 2001; Gerber and Krushell, J Bone Joint Surg Br 73:389–394, 1991). Normal shoulder biomechanics depend heavily upon a functional subscapularis for dynamic stability of the glenohumeral joint. Patients with subscapularis insufficiency tend to present with anterior shoulder pain, weakness with internal rotation, increased passive external rotation, and sometimes with anterior glenohumeral instability. Physical examination tests designed to elucidate subscapularis pathology include the lift-off test, internal rotation lag sign, the belly-press test, the belly-off sign, and the bear-hug test. MRI remains the most useful and widely utilized imaging modality to confirm and characterize subscapularis disease. The majority of subscapularis tears can be treated with either arthroscopic or open primary repair. Significant muscle atrophy, fatty infiltration, tendon retraction, and large tear size reduce the chance of successful primary repair, and in extreme cases make such tears irreparable. Management of these tears remains a challenge, with musculotendinous transfer of the pectoralis major being the most commonly employed treatment option. 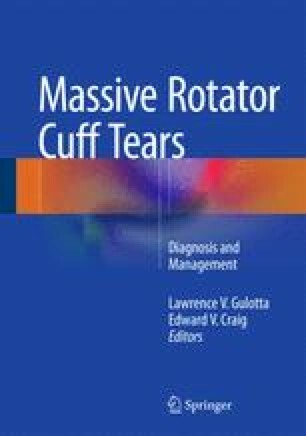 General indications are pain, anterior instability, and/or significant functional limitations after failure of nonoperative management in the setting of an irreparable subscapularis tear. Contraindications include concomitant irreparable supraspinatus tear, advanced patient age, severe glenohumeral joint arthrosis, fixed anterior joint subluxation, an inability to comply with postoperative measures and rehabilitation, and pectoralis major dysfunction/insufficiency. Several techniques have been described and vary primarily upon the amount of tendon transferred as well as the location of tendon passage as it relates to the coracoid process and conjoined tendon. Postoperative rehabilitation protocols generally call for 6 weeks of immobilization with early pendulum exercises and gentle passive external rotation, progressing to active range of motion at 6 weeks, and strengthening beginning at 12 weeks. Robust outcomes data for this procedure is largely lacking in the current orthopedic literature, but many smaller clinical series suggest improvement in pain and incremental functional gains. As such, pectoralis major tendon transfer remains the workhorse salvage procedure for the management of the irreparable subscapularis tear.